Prototype: Class Z 161 rail bus motor car based on the class VT 95.9 rail bus. Luxembourg State Railways (CFL). Without a skylight window above the engineer's stand. The rail bus looks as it did around 1964/65. 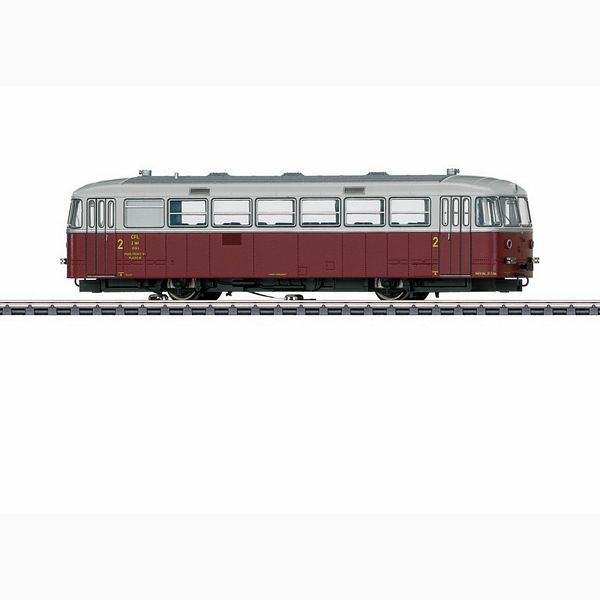 Model: The rail bus has an mfx+ digital decoder and extensive sound and light functions. It also has controlled high-efficiency propulsion. 2 axles powered. Traction tires. The rail bus has factory-installed interior lighting. The rail bus has triple headlights and dual red marker lights that change over with the direction of travel, will work in conventional operation, and can be controlled digitally. The headlights at the Engineer's Stand 2 and 1 can be turned off separately. Maintenance-free warm white and red LEDs are used for the headlights, marker lights, and interior lighting. The engineer's stands and the car's interior allows an open view through the windows. Brake hoses and a drawbar coupling for attaching a car with a standard coupler pocket at a standard height are included. Length over the buffers 15.2 cm / 6". "World of Operation" mfx+ digital decoder and extensive operation and sound functions included. This model can be found in a DC version in the Trix H0 assortment under item number 22395. Locomotive body chiefly made of metal.